Assisting Director-General Ikeda were the people that paved the way for the signature: Simon Sweeney, Steel Frame Buildings Section Leader; Laurent Schmieder, Head of the Site, Buildings and Power Supplies Division for Europe; and Assistant Angele Corso-Leclercq. 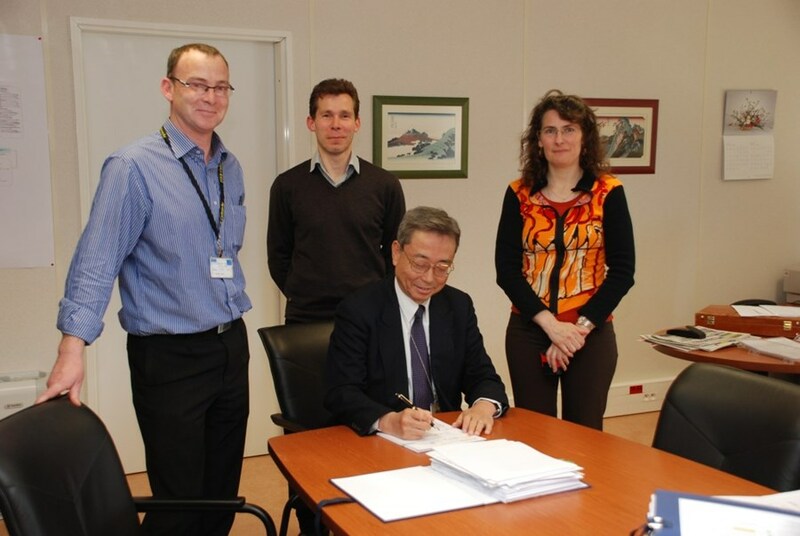 It may have been signed on 1 April but this is far from being an April Fool's joke: last week, ITER Director-General Kaname Ikeda signed the application for the construction permit for the Poloidal Field Coils Winding Facility that will be the first structure to take shape on the ITER site this summer. "This facility together with the permanent office buildings, which are expected to rise this year as well, will clearly mark the fact that ITER is moving towards its construction phase," the Director-General stated. "This visible progress will do everyone good."